I was quoted in a recent Photonics Spectra article “Cold-Atom Lab in a Box“. 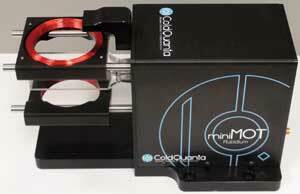 The article describes the new Rubidium miniMOT available from ColdQuanta. My Photonics and Quantum Optics Lab at Pacific University was among their first customers. We’ve really enjoyed being involved with the early stages of this product and look forward to contributing to MOT research at the undergraduate (and perhaps high school) level. For pictures of our trap in operation, see my earlier post “MOT!“. We have done a variety of experiments and have trapped atoms in several different geometries since then. More details are described in the talk given by Simone Carpenter at the Northwest APS section meeting: Off-the-shelf atom trapping [PDF] and the corresponding poster Off-the-shelf atom trapping. Part II of a very cool NOVA series airs on PBS stations tonight. Pun absolutely intended. Second pun not as intended, but still amusing. Many all-star players from the Atomic, Molecular and Optical physics world, several of which are Nobel Laureates, make appearances on this second part of the program. The first part aired last week and covered many interesting aspects of early thermodynamics. One great piece of trivia was about the original Celsius scale, and the fact that it was originally reversed, with zero for the boiling point of water, and 100 for the freezing point. This is really too bad, since he was very close to getting the right sense of temperature. Many argue that the thermodynamic beta is a more direct representation of temperature. Since Beta scales as the inverse of T, Celsius’ original scale at least went the right direction, even if the degree sizes weren’t right.